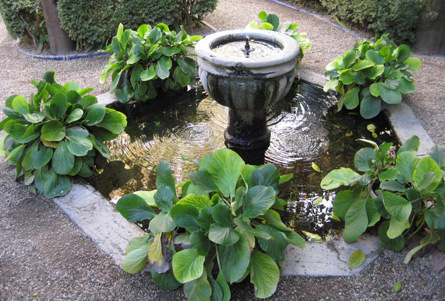 Elements of the grandeur of the French chateau with its fountains and parterres, or the sculpture and large terracotta pots of the Italian villa, are also relevant in the gardens of many modern houses. The formal garden is built around a central axis. Secondary axes create frames for garden beds and paths, with a visual treat - such as an accent plant, sculpture or seat - at the end of each axis. The focus is on plant form rather than diversity. 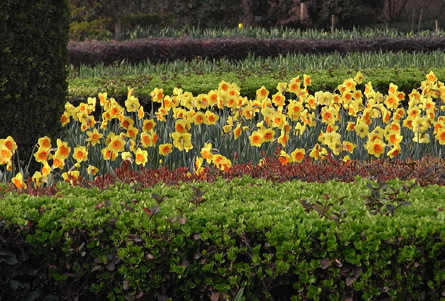 Few plant species are chosen but they're mass planted in geometric blocks of foliage in different restrained greens rather than for vibrant flower colour. Flower beds are defined within a parterre while herbs and vegetables are rounded up inside the structure of a knot garden. 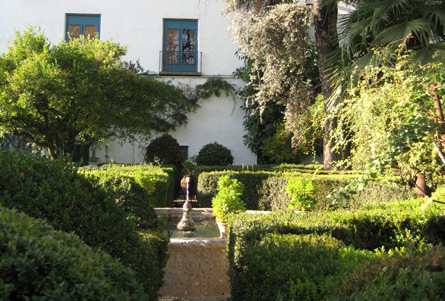 Hedges are a common element and similar small-leafed plants are also trained into standards and topiary shapes such as circles, squares or even animals. Naturally geometric conifers save on pruning time. Lawns are carefully manicured while citrus, olive and other fruit trees are trained as in symmetrical patterns as espaliers against a wall. In large gardens, avenues of pleached trees create privacy, screen out unattractive views and frame vistas, sculptures or fountains. 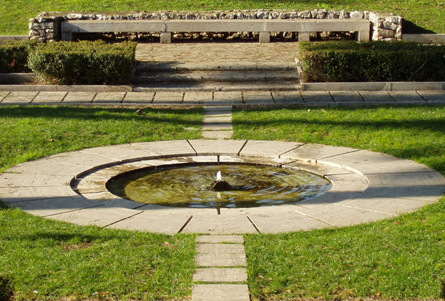 Hardscape elements reinforce the symmetry and balance of formal gardens. Gravel paths are a loose contrast against tightly clipped hedges, and masonry walls reinforce strong lines. Levels are flat and terraces laid with large format stones or pavers. Furniture and sculpture are classic and elegant in style. Rather than a collection of small containers, large individual pots or urns are featured with formally clipped or accent plants. Use the Plant This Plant Selector to help choose plants that will work in a formal garden style.